Do you need more power and distance off of the tee? 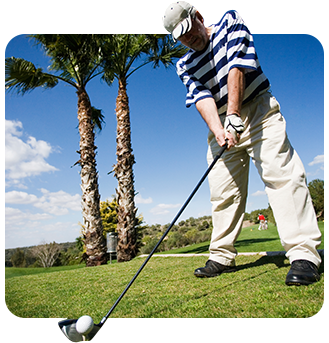 Do you desire improved endurance and stamina to play 18 holes feeling strong all the way through the round? Or do you seek improved balance and strength to have better control of your swing? Focus Golf performance specialist use a scientific process of analysis and training aimed at enhancing the athleticism and performance of golfers at any skill level. We will evaluate how you move, your strength, range of motion and flexibility throughout your body and conduct a series of movement screens to assess your body’s functional mobility specific to golf to identify mechanical faults within your body, which may be limiting your golf swing potential. After identifying your body’s mechanical constraints that interfere with your golf performance, your specialist will review the findings and your goals and work with you to design a plan to elevate your game. The program will include hands on mobilization and correction of movement restrictions, a unique and vital component to helping one swing the club with more speed and power. In addition to manual correction, your specialist will customize a golf fitness exercise program with movements that are authentic to the golf swing.